‘Home’ From Dreamworks Animation Trailer Is Here!!! Dreamworks Animation has got another film headed to release in March of 2015. This time around, they’re hitting the “alien hiding out on earth” theme. 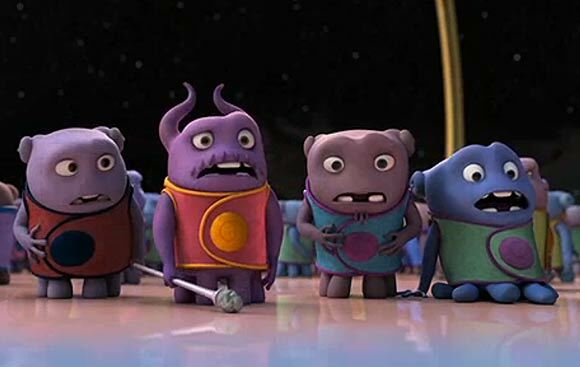 ‘Home‘ will, of course, be released in 3-D and feature the voices of Jim Parsons, Jennifer Lopez, Steve Martin and Rihanna. With Parsons and Martin involved in the voice acting, ‘Home‘ has some hope of being more than just cookie-cutter dreck that seems to clog up the multiplex every week. Check out the trailer for ‘Home‘ and tell me what you think about it? Enjoy. This entry was posted on Thursday, June 12th, 2014 at 11:23 pm	and is filed under Books, Film, News. You can follow any responses to this entry through the RSS 2.0 feed. You can skip to the end and leave a response. Pinging is currently not allowed. « The ‘Penguins of Madagascar’ Trailer is Here with Benedict Cumberbatch! !